The UK has warned Russia that it will pay a "high price" if it continues to use chemical weapons following the Salisbury nerve agent attack. 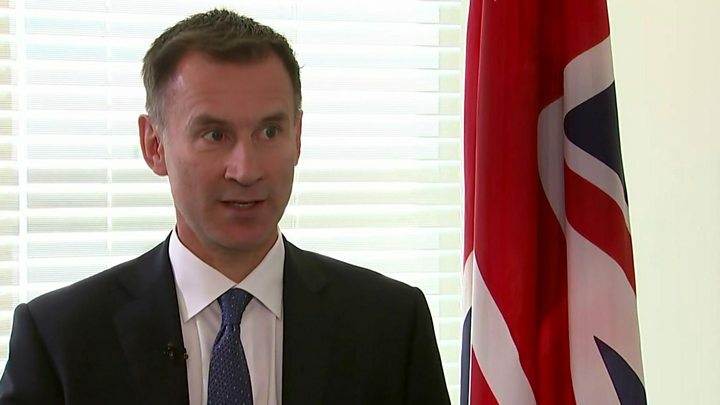 Foreign Secretary Jeremy Hunt told his Russian counterpart Sergei Lavrov that it was not acceptable "to instruct military intelligence officers to use chemical weapons on British soil". Mr Hunt told the BBC that, after nuclear weapons, there was "nothing more horrible than chemical ones". Russia denies the poisoning in March. In the nerve agent attack, ex-Russian spy Sergei Skripal - who sold secrets to MI6 - and his daughter Yulia were poisoned with Novichok in the Wiltshire city of Salisbury. Both Mr Skripal and his daughter survived, but Dawn Sturgess - a local woman not connected to the original attack - died in July after being exposed to the same substance. Media captionJeremy Hunt: "There is nothing more horrible, more lethal, more deadly"
Speaking on a visit to the United Nations General Assembly in New York, the foreign secretary said: "We've had chemical weapons used on the streets of Salisbury and chemical weapons used in Syria under Russian patronage and, for the sake of humanity, we need to make sure that we do not turn the clock back on this. "That is why it is very important that Russia understands the international community is totally resolved on this and anyone who uses chemical weapons needs to know the price will always be too high." 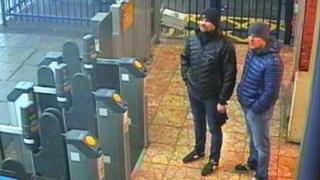 Last month, UK investigators identified two suspects who had links to Russian's military intelligence service, known as the GRU. The two men appeared on Russia's state-run international broadcaster RT and insisted they were simply tourists visiting Salisbury to see its "famous cathedral and its 123m spire". On Wednesday, investigative website Bellingcat reported that one of them was a military officer who served in Chechnya and Ukraine and was made a "Hero of the Russian Federation" in 2014. The honour, bestowed on Colonel Anatoliy Chepiga in a secret ceremony, is typically handed out by Russia's president Vladimir Putin. In his interview with the BBC, Mr Hunt said counter-action was being taken against Russian military intelligence. He said it was always going to be possible for a large state like Russia to find a way of issuing fake passports to get such people into Britain but everything possible was being done to prevent abuse of the visa system and visa checks. Addressing world leaders at the UN on Wednesday, Theresa May criticised Russia for its "desperate fabrication" over the poisoning. The prime minister accused Russia of "flagrantly breach[ing] international norms" citing "the reckless use of chemical weapons on the streets of Britain by agents of the Russian GRU". Russia continues to dismiss and ridicule all suggestions it was involved in the attack and says no investigation in which it is not actively involved will ever be credible or fair. Writing on Facebook, Russian foreign ministry spokeswoman Maria Zakharova described the Colonel Chepiga allegations as groundless. Komsomolskaya Pravda, a pro-Kremlin tabloid, published an online article listing "three reasons" why Chepiga was not involved in the Skripal poisoning, adding that he was not a Russian secret services operative.